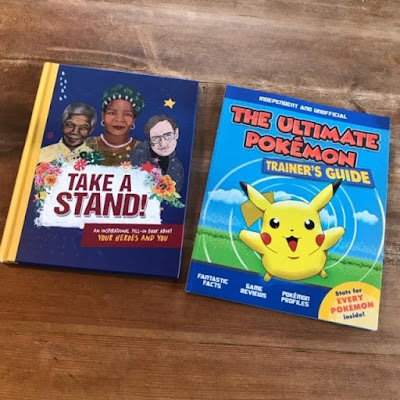 Review: Carlton Books - The Ultimate Pokemon Trainer's Guide & Take A Stand! 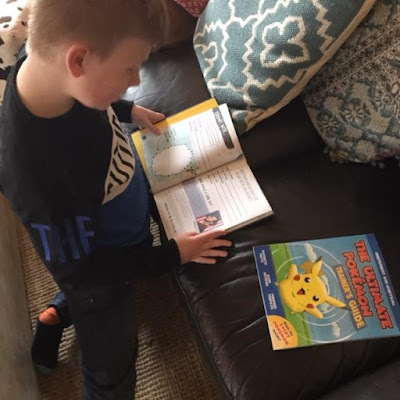 This month Logan received two lovely books from Carlton Books to review. The Ultimate Pokemon Trainer's Guide and Take A Stand! Both are fabulous books but the Pokemon one takes me back to my youth. When I was in primary school is when my obsession with Pokemon began. I remember a friend showing me the game on his gameboy and I was hooked. My interest gradually faded when at high school however I still have all of my Pokemon collection and it was great to sit and read this book together with Logan. The Ultimate Pokemon Trainer's Guide is packed full of fun and interesting information as well as stats for every Pokemon.It's an unofficial guide but well worth a purchase for those Pokemon fans in your house. 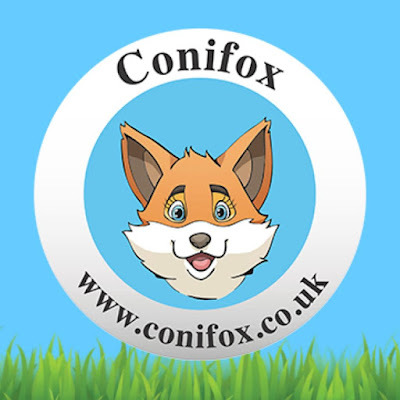 Inside you'll find Pokemon reviews, toys, card games, movies, facts and tips. It has every single 800+ Pokemon including strengths, weaknesses and combat stats. It's a fabulous Pokemon encyclopedia. This book has 64 pages of Pokemon magic and retails at £7.99. Logan loved his copy. He's read it cover to cover several times and it sits proudly in his bookcase. 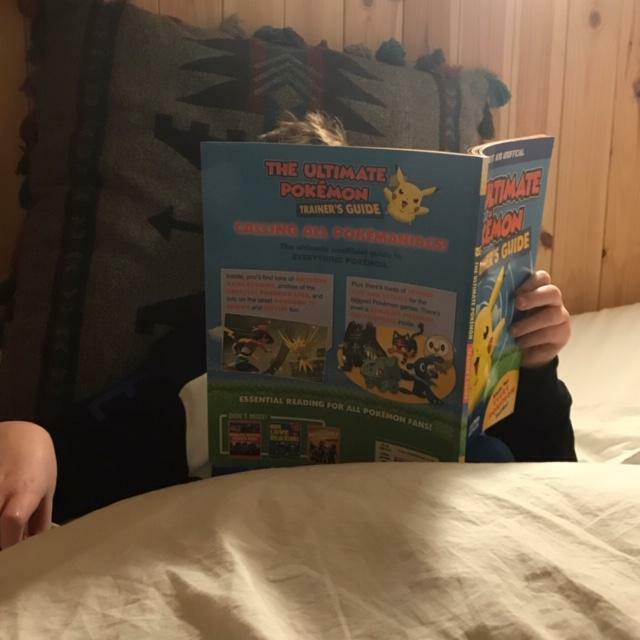 He loved reading about the Pokemon games and asking me if I had played them. When I told him I still had some his little eyes lit up. His favourite part of the book had to be the Pokemon stats. He made me google each Pokemon so he could see more and was intrigued by their evolution stages. Honestly a lovely book to have in your collection. Take A Stand! is another brilliant book. It's an inspirational fill-in book about your heroes and you. This gorgeously illustrated keepsake book will help young modern rebels find their inner hero. It's full of quotes and stories from the likes of Spartacus, Gandhi and Stephen Hawking to JK Rowling and Anne Frank. 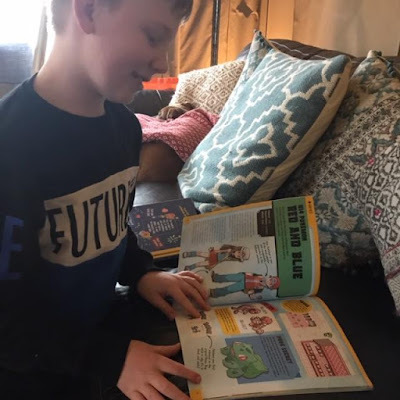 Young readers can find out what their heroes would do in a range of challenging every day situations such as peer pressure, bullying, anxiety, school work and more. It really is a great read. I love the fact that this book has lots of sections for your child to fill in as well. It has areas to reflect on each situation and how they might react. Places to write about family and friends as well as a lovely calendar at the back. It'll definitely keep your child occupied for a while and it's a book they can go back to constantly. Like a sort of reflection diary. This book has 80 fantastic pages and retails for £8.99. Logan really enjoyed reading about all the heroes stories. He found Spartacus particularly fascinating and how his fellow soldiers and friends protected him by not handing him over to the Romans. I found this book a fascinating read myself, I always think every day is a school day so it's lovely to learn some new facts. Both books would make excellent gifts and I'm sure the recipient would be very happy to receive one. Do check out the Carlton Books website for more information and other brilliant books. I was sent these books in exchange for an honest review. All opinions are my own. 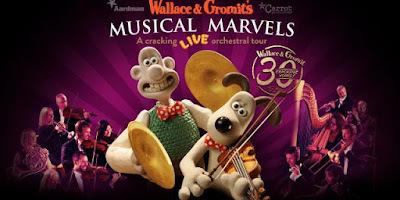 Giveaway: Wallace & Gromit’s Musical Marvels Tour Coming Soon! THE musical event of 2019 is coming! 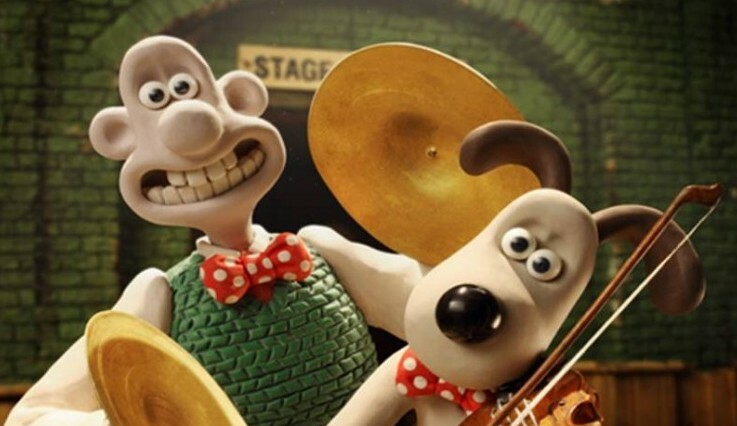 In May and June 2019, Carrot Productions will tour Wallace & Gromit’s Musical Marvels across the UK. I don't know about you but my kids personally love a bit of Wallace & Gromit, in fact we watched some on CBBC the other day. A Close Shave I think it was called. It takes me back to the episodes I used to watch as a kid. It's a classic that never really gets old no matter what your age. So if you love a bit of Wallace & Gromit, like my family do, then be sure to join everyone’s favourite dynamic duo as Wallace prepares to perform his musical masterpiece My Concerto in Ee Lad with help from his faithful canine companion Gromit…what could possibly go wrong?! This fabulous interactive experience features specially created animations as well as live orchestral accompaniment and escapades from the Picture House Orchestra and presenter Matthew Sharp. 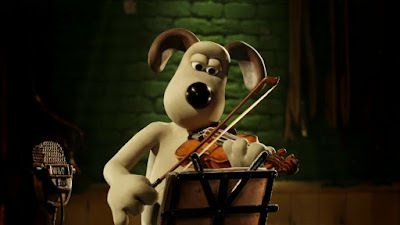 And if that wasn’t enough, for the first time ever, you can also enjoy the Academy Award® winning Wallace & Gromit film The Wrong Trousers with live orchestral accompaniment. It’s set to be a grand day out for the whole family! I honestly can't wait to tell Logan about this as he'll be so excited for the show. I don't think he's ever seen a show with a live orchestral accompaniment so it'll be a brilliant new experience for him. We're popping along to the show at the Usher Hall in Edinburgh on 8th June but there's also performances in Glasgow, Liverpool, Manchester, Blackpool and many more. Check out their website for more details and helpful information. Luckily for you lot as well you could be in with a chance of winning your very own family ticket to see the show in a location of your choice! Yes, any location you choose (excluding Beaconsfield premiere on 15 May and anything marked as Schools Only). Could be Leicester, London, Birmingham or Edinburgh like me. Simply enter via the rafflecopter widget below. Good luck! This is a collaborative post. All opinions are my own. What a busy two weeks it's been for my little family. We've crammed so much in I need a break from the breaks! It's all been good fun though and if you've been following my Insta Stories you'll have seen all the exciting things we got up to. If not though I'm going to tell you a bit about it below, so read on to see what we all got up to during the Easter school holidays. 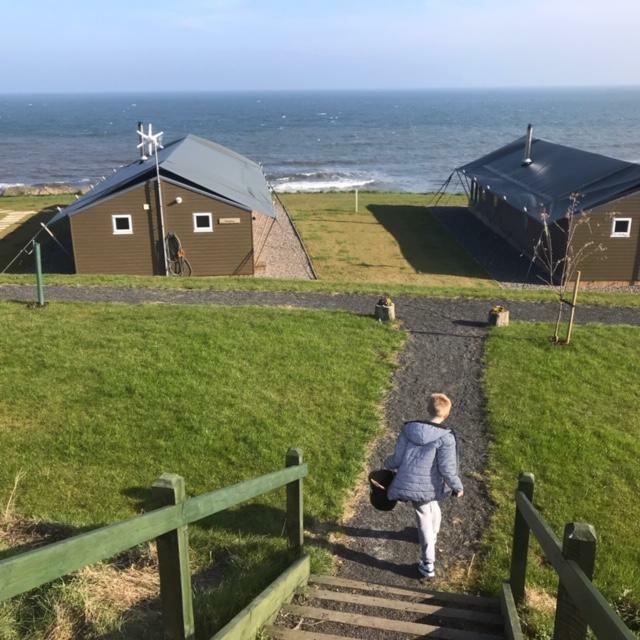 So our Easter break kicked off with a fabulous weekend stay in Elie thanks to Catchpenny Safari Lodges and Jenny from Monkey and Mouse. You can read a full review on Jenny's blog but I'll also tell you a little bit about it here. We’ve done some glamping before but CatchPenny take it to another level. These beautiful safari style lodges, of which there are 8, lay nestled along the East Neuk of Fife. Right next to the beach with fantastic sea views for miles, you have prime access to the famous Fife Coastal Path. Harlow is a right beach comber so we were hunting for crabs and sea creatures practically every day. The lodges are super luxurious with everything you need, including and amazing bathroom with hot shower, for a comfortable stay. I'd highly recommend them plus they're dog friendly, yay! Next up us adults had the chance at a wee solo trip to London without the kids. My husband won a 2 night stay at the Moxy London Stratford so we couldn't pass up the opportunity for some us time. My lovely mother-in-law took the kids and we flew to London to enjoy ourselves. 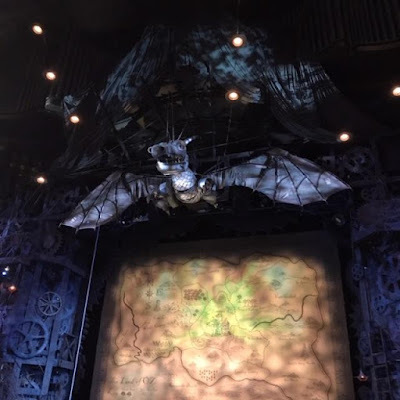 We ate out and didn't have to share our food, traveled the underground with no screaming kids and we even got to see a show! We managed to secure tickets to the fabulous Wicked performance at the Apollo Victoria Theatre. OMG what a show! Everything about it was amazing and I'd definitely go back to see it again. When we got back home and resumed our parental duties we took the kids to Blair Drummond Safari Park for the day. The had their Big Spring Fling on which meant lots of extra activities for the kids to enjoy. 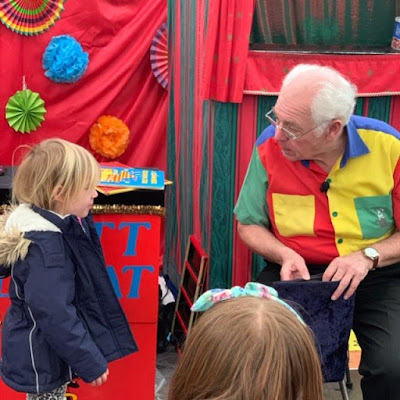 Magic shows, arts and crafts, 3D cinema - it was all great fun. We literally spent the whole day there and still didn't manage to do everything. I'm sure we'll be back soon for more fun. Another Disney On Ice show had rocked into the SSE Hydro in Glasgow so we were invited along with the kids. I took some friends as well as there's nothing better than sharing the magic than with your besties. It was a typically lovely show with tons of Disney characters from Rapunzel, Dory, Nemo, The Lion King and of course the favourite - Frozen! It's not a Disney On Ice show unless the Frozen sisters are in it. The kids all seemed to really enjoy themselves and I was happily singing along to every song too. Can't wait for the next show. We didn't have much planned for the second week of the holidays so I booked us a trip to Inverness. Well we stay in lodges just outside Inverness in Drumnadrochit but it's not far. One of the things the kids were looking forward to most was getting back to the awesome Landmark Forest Adventure Park. 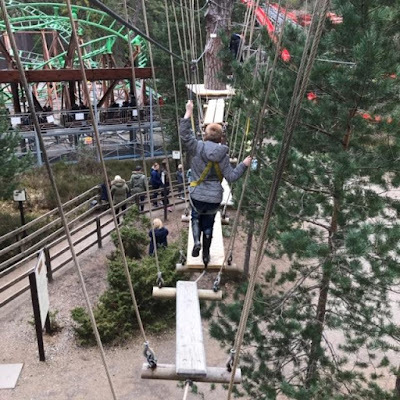 It's a massive park nestled into the woods in Carrbridge (not far from Aviremore) and it has loads of cool stuff for the kids to do. 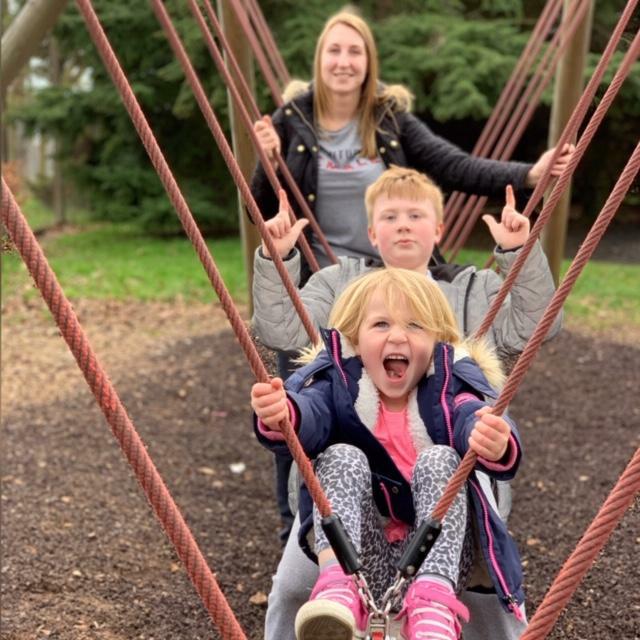 There's huge play park, wild water slides which are so much fun, a beautiful butterfly house, lots of trails in the tree tops, a red squirrel walk, labyrinth maze and not to forget the mind boggling Bamboozeleum full of illusions. This is Logan's absolute favourite, it has so many different illusions and we totally love it. If you ever get the chance to visit Landmark Forest Adventure Park definitely take it. We spent all day here and never left until the very end. Loved it. 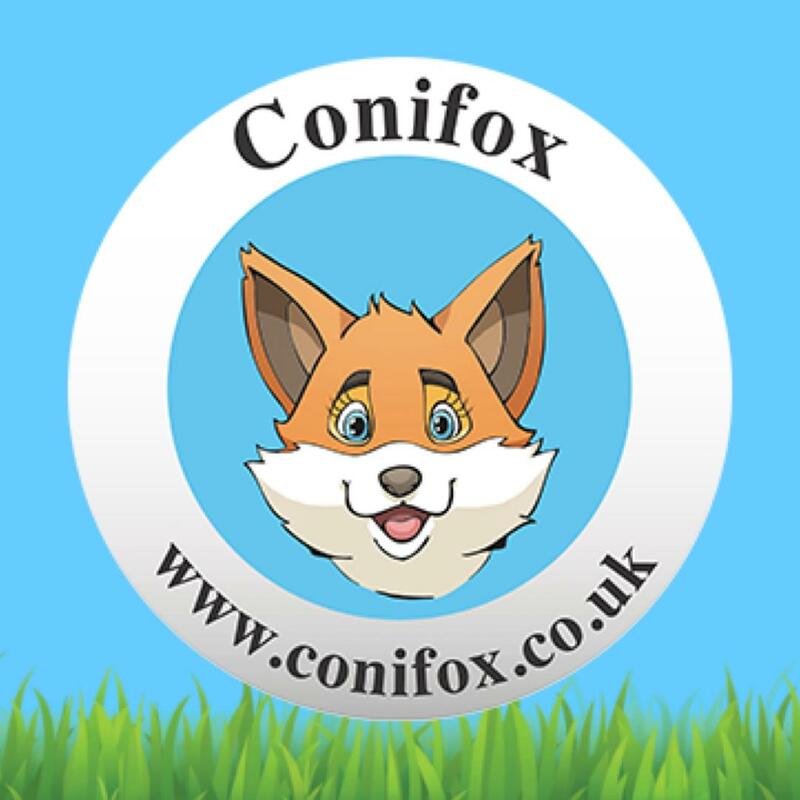 The school holidays are almost over but for one last treat we're taking the kids to the exciting Easter Egg hunt at Conifox Adventure Park this weekend. 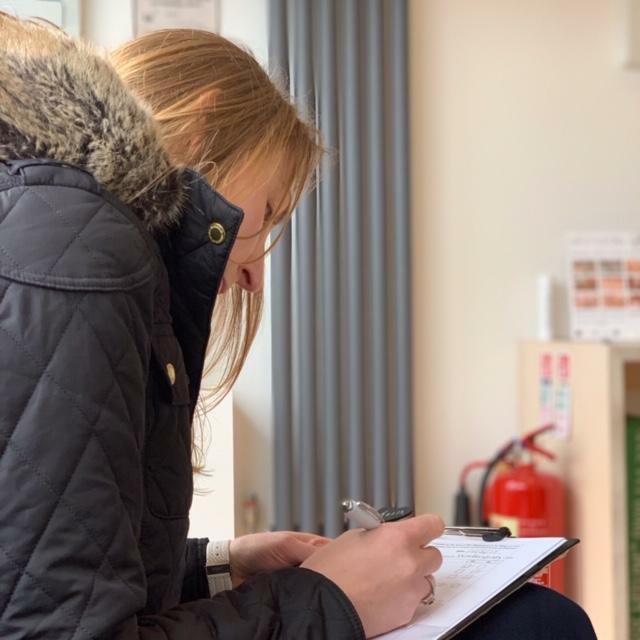 There's a chance to find all the clues and win a medium sized egg or be super lucky and find a golden egg to win a large Cadbury's egg! How exciting. My hubby has pretty good attention to detail so I'm hoping he'll find a golden egg, haha. I'd love to hear what you've all been up to this Easter? With the better weather coming in I'm just hoping to get all of my holiday washing done now! Some of the days out in this post have been gifted however all opinions are my own. 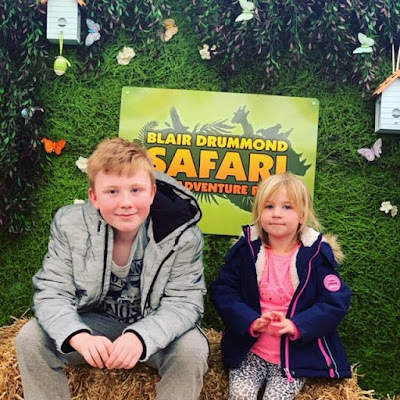 If you're looking for something totally roarsome to do with the kids this Easter then head over to Blair Drummond Safari Park for their Big Spring Fling! 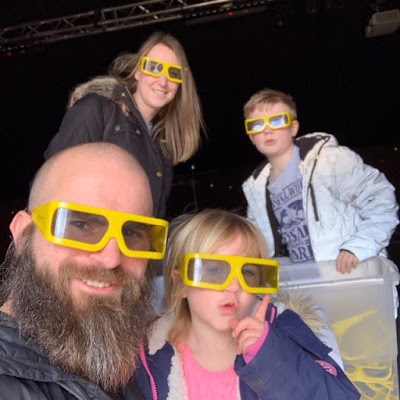 As well as the usual amazing animals and attractions there's a lovely 3D cinema, magician and puppet show, arts & crafts plus an Easter bunny trail. All of these extras are absolutely FREE! So as you can imagine there's loads to keep the kids busy. We visited as a family just the other day and stayed to the bitter end. And even though we were there all day I feel we still didn't manage to fit everything in there's just so much fab entertainment. When we arrived at the park we did our usual and drive round the animals first. The sun was shining and the animals were on top form. 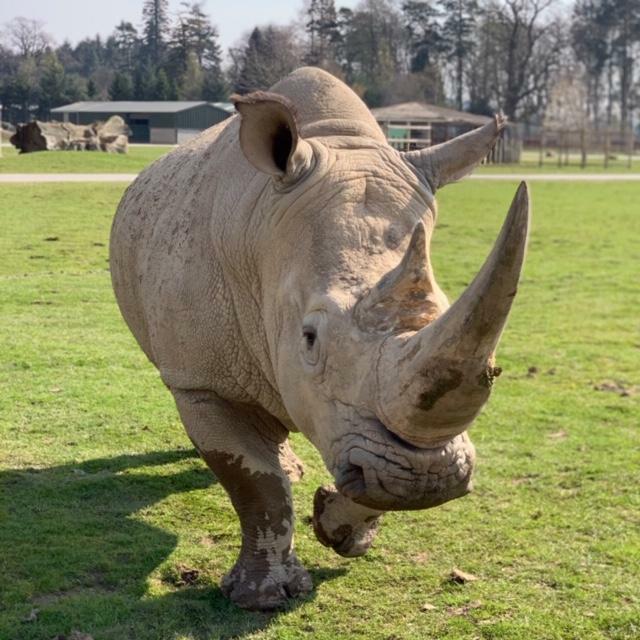 The rhino was trotting around eating grass and came right up to the car! Quite scary when they get so big. All the different species of deer and cattle animals were milling around nicely and we even caught one of the female lions chasing a cheeky bird. She almost nearly caught it! Logan had a little shot of driving the car round the animals which he loved. He just sat on his Dad's knee. I remember doing this as a child and loving it, good memories. We then parked the car and headed over to The Big Spring Fling tents next to the BBQ area. It's normally called the marquee and is marked on the guide map. Very easy to find. The 3D cinema was about to start so we headed there first. It was a lovely short film about the Easter bunny, very funny for the kids sense of humour. My two loved it that much we went back later to watch it again. After that the magician and puppet show was starting so we popped in to see what it was all about. The guy doing the show, Scott Lovat, was brilliant. He was so kind and really good with the kids. My two got really involved and both got picked to help with his acts. They were super thrilled and had so much fun. I'd definitely recommend putting some time aside to see the show. In the same place there is also arts and crafts so children can stay after the show and get stuck in. Also make sure and take part in the Easter bunny trail. There are 5 wooden bunnies dotted around the park with a different letter on each. Collect the letters to make a word and win a little prize from the marquee. Next up was lunch so we headed to the restaurant to fuel up for the rest of the day. I always find their lunches tasty and that day was no exception. Harlow and I had the macaroni, Logan had steak pie and the husband had a hot dog. All very tasty and we finished every bite, delicious. 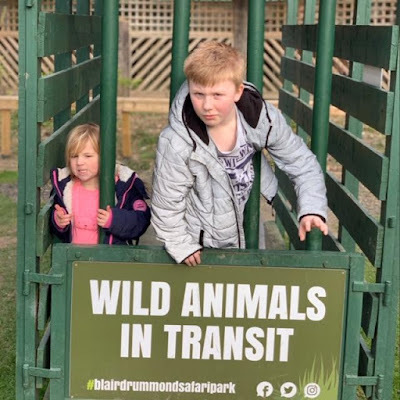 They still have some fun amusement rides at Blair Drummond Safari Park so the kids and I hopped on a few. 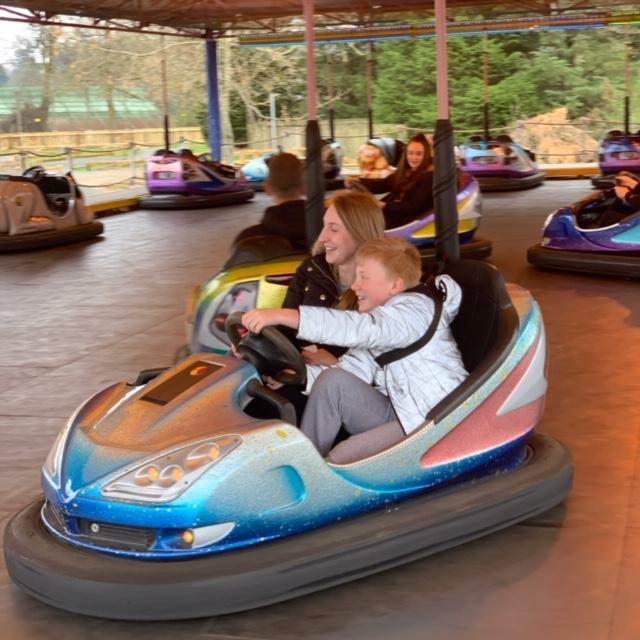 Logan loved the dodgems the most and Harlow was thrilled with the mini aeroplanes. One of our other favourite rides was the big slide. The kids must have gone down this at last 7 times each, it meant the hubby and I got a shot and a break too. 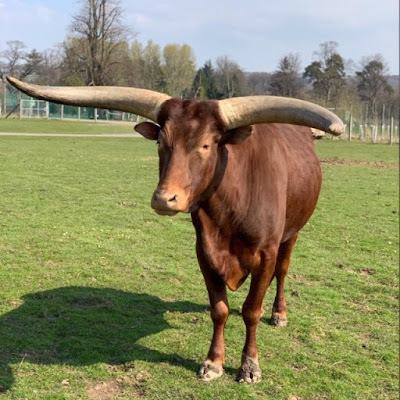 We decided we'd have a look around the animals in the park as well. Lemur Land is always great as you get to walk amongst the lemurs. Harlow thought this was brilliant, we even spotted a tiny baby lemur clinging onto it's mummy. Very cute. The sea lion show is always good and walking to meet the meerkats is another favourite. The safari park has a massive play ground as well with tons of different swings, forts and sand pits. We spent a lot of time here letting the kids burn off some energy. Before long it was time to hit the road and head towards home. We were the last car to drive through the animals so we got to see them getting put to bed for the night. The lions were particularly feisty and the ankole cattle where jumping around excited to get some dinner. We really did have an awesome day and will definitely be back again soon. There's always something new to discover at Blair Drummond Safari And Adventure Park. This was a gifted trip in return for an honest review. All opinions are my own. Easter is a fab wee time of year when everyone gets excited about chocolate eggs, bunnies and fluffy baby chicks however not everyone can have chocolate (so sad). 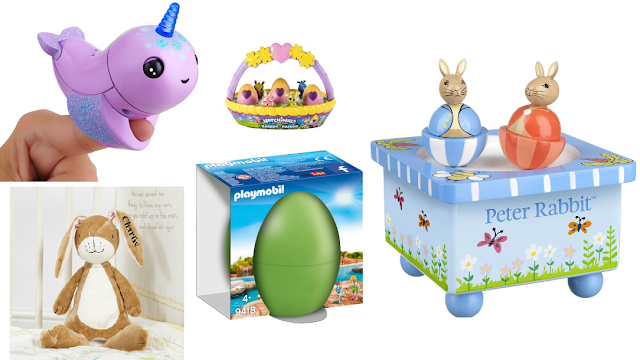 In light of this I've put together a little alternative Easter gift guide for kids as it's still nice to receive a little something. Maybe I should do one for adults as well as I'd rather avoid tons of chocolate in the house! The less temptation to binge the better. This beautiful cuddly bunny is from Born Gifted and it's totally stunning. It's part of their personalised Easter gifts range. I love a personalised gift and this one is perfect for the kids. Imagine having your own name on your bunny to snuggle and treasure forever. It's a fab gift idea and only £23.99. I don't know about your kids but my daughter is constantly talking about Hatchimals at the moment. There's lots of different kinds to collect but I thought this cute basket set was perfect for Easter. I think it's currently reduced on Amazon to £10 so get in there quick if you want one. I love music boxes and this cute Peter Rabbit wooden one is perfect for smaller children, babies especially will love listening and watching the little bunnies spin round and round. 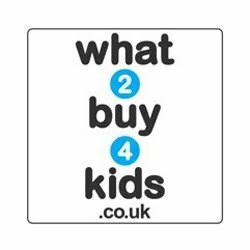 You can purchase this from What2buy4kids for £16.99. Remember to use my code BREASTNEWS2018 for a lovely little discount. Fingerlings are a big hit in our house. We have a few of the monkey ones but have you seen the amazing new Narwhal range!! Oh my they're so cute and shiny. Harlow squealed with delight when she spotted them in the shops. She can't wait to get her hands on one. Smyths Toys have a few for £16.99. I love the idea of a toy egg instead of a chocolate egg and this little beaut from Playmobil is perfect. They're only £4.99 and come with some toys inside. They're the perfect budget friendly Easter gift to give the kids plus they'll last for years. The Wonderful World of Disney On Ice is coming to Glasgow! 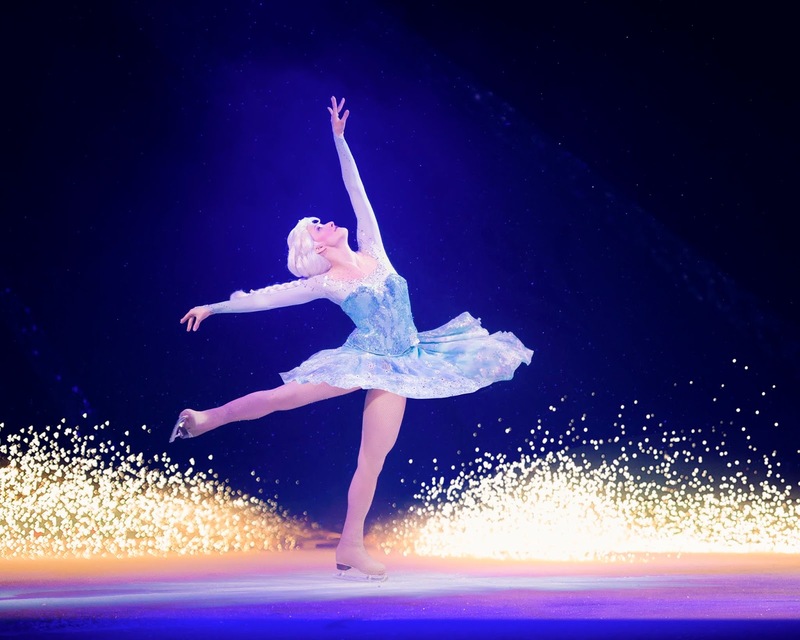 Disney On Ice is coming back to Glasgow this month with an amazing new show at the SSE Hydro! The last show we saw was Dream Big with Moana and Maui back in 2018 so the kids are very excited for the next installment. 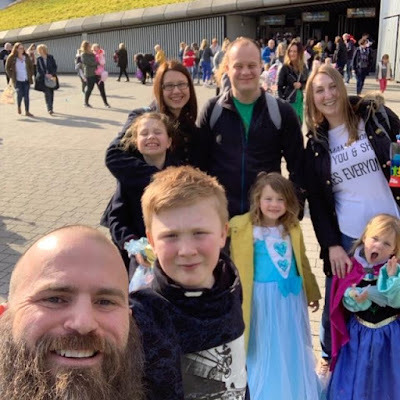 Here's a little bit about the show directly from the Disney On Ice team to get your juices flowing for the main event. Enter a dazzling world of adventure at The Wonderful World of Disney On Ice! Join Mickey Mouse and Minnie Mouse on an inspiring walk down memory lane in celebration of magic and family fun. The production will visit the SSE Hydro in Glasgow from 11th – 14th April 2019. Tickets are available from www.disneyonice.co.uk and priority customers can take advantage of the pre-sale to get their hands on the best seats by heading to www.prioritycustomer.co.uk. Dory is back with friends Nemo and Marlin from Disney Pixar’s Finding Dory. Embark on a new ocean adventure as they discover the real meaning of family. Travel to Arendelle with Anna, Elsa and the hilarious Olaf from Disney’s Frozen as they learn true love is the greatest power of all. Nothing is out of reach for Rapunzel as her friends help light the way. Snow White and the Seven Dwarfs make their own magic and reveal we can do ANYTHING with our friends in tow. Buzz and Woody will have you jumping out of your seat in a foot-stomping throwdown; Simba, Timon and Pumbaa prowl the Pridelands; Jasmine, Aladdin and Genie show friendship is fearless; and your favourite Disney Princesses stay strong and journey on. Plus, arrive early to learn the Mouse Bounce Dance at the Fit to Dance pre-show! Make unforgettable memories as you explore The Wonderful World of Disney On Ice! 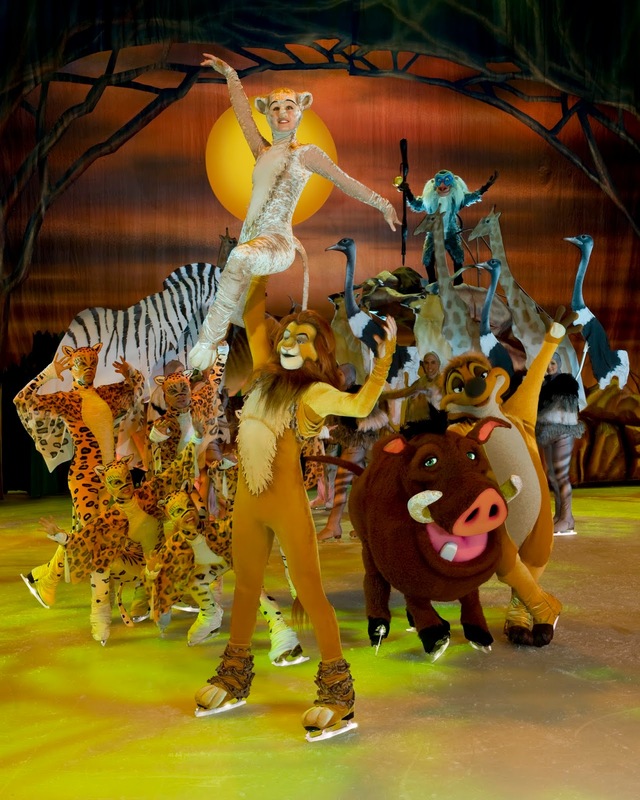 We're all particularly looking forward to seeing Simba, Timon and Pumbaa as haven't spotted the Lion King crew on the ice before. It should be loads of fun and packed with exciting adventures. Have you ever thought of having a whiter smile? It’s something I tend to think about quite a bit. I drink a lot of tea and I’m always conscious that it seems to stain my teeth a bit so having whiter cleaner teeth is something I’ve always wanted to do. It just always makes me feel better when my teeth look better as it’s one of the first things people notice about you. 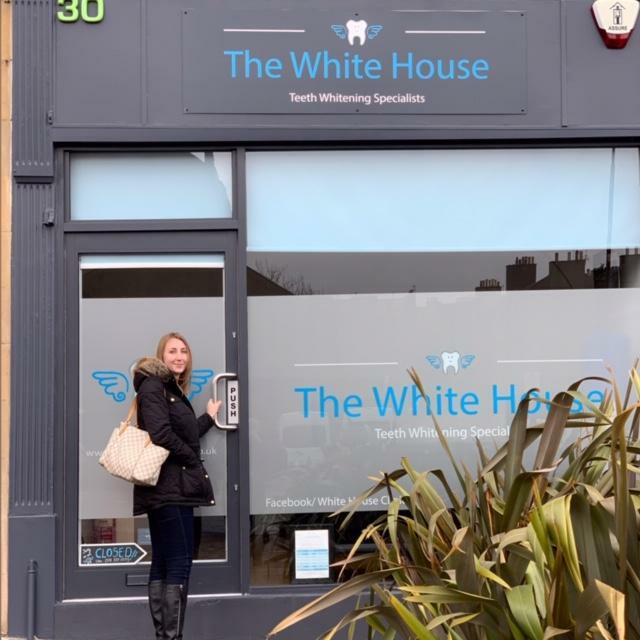 So when the lovely people from The White House invited me along to their Edinburgh clinic for a treatment I couldn’t have agreed fast enough. My procedure of choice was to be the advanced in-clinic dental whitening treatment performed by the lovely Kerri-Lee. 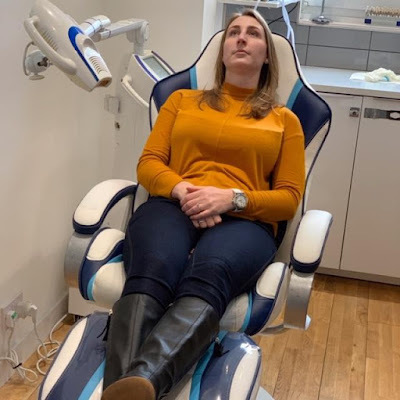 It’s always worth doing your homework when it comes to any treatment on your body but I’m glad to say that Dr Kerri-Lee Clark is a fully qualified dental surgeon who has undergone further training at the London School of Facial Aesthetics in both Beginner and Advanced courses in the use of Botulinum Toxin. So she definitely knows her stuff. The White House is located on West Annandale Street, which is a very short walk from Edinburgh Playhouse. Upon my arrival Dr Kerri-Lee was super friendly and very helpful in explaining what would happen. I also noticed how nice and clean the whole place was. I signed the consent form and was taken through to the dental chair. Kerri-Lee then talked me through the whole procedure from what shade my teeth currently were to how they would hopefully look. How the gel would feel when applied to my teeth, what the light would feel like and what it actually does, the time taken for the whole treatment etc. It was very reassuring and no question was unanswered. Dr Kerri-Lee was more than happy to help in any way she could. Once settled in the chair with my mouth guard in, gel applied to my teeth and the light switched on, I got to sit back and relax and watch Friends on the TV. They have Netflix so can change it to any channel you want. It definitely makes time go by so quickly when you’re watching a good show. I sat in the chair for around 45 minutes. This was broken down into 15 minutes blocks with the gel applied 3 times and Kerri-Lee coming back and forth to check on me and make sure everything was ok. I feel like I have quite sensitive teeth however I felt no pain what so ever having this whitening treatment. The gel was cool to go on but quickly warmed up and the light was warm but in a nice way. I’d honestly go back and do it all again tomorrow. 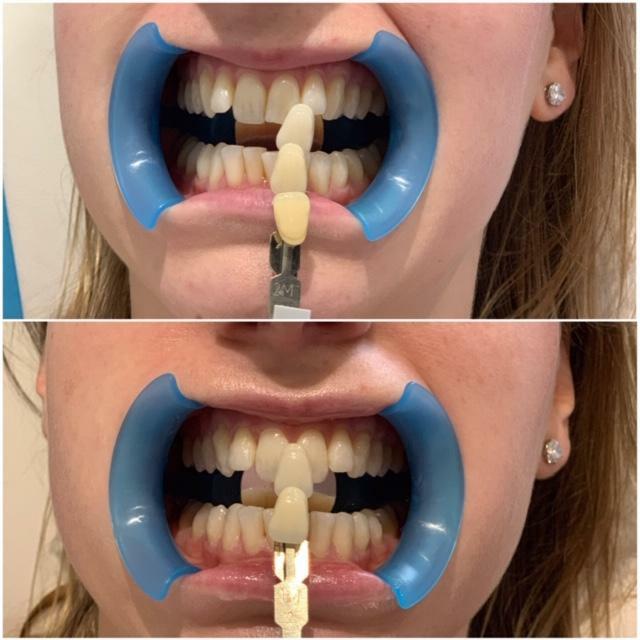 When your treatment is finished you get shown how much your teeth colour has improved. I went from a shade 3 to a 1, which is the highest you can get, and was very pleased with the results. My teeth looked so much fresher, even my other half noticed an instant difference. Dr Kerri-Lee also explained the after care I needed to follow having only a white diet for 24hrs after to help maintain that brighter smile. So no curry, tea, coffee, tomato based foods, red wine or even coloured dental products. Milk, water, rice, chicken, fish, cream soups or pasta are all ok. It’s really easy to follow for only 24hrs. If you want to aid your continued teeth whitening then there are specialist toothpastes which you can buy in the clinic. I’d definitely recommend doing this as now your teeth are whiter it’ll be easier to maintain straight away. The advanced in-clinic dental whitening treatment is currently on offer at £169 (saving you £121 off the normal price). 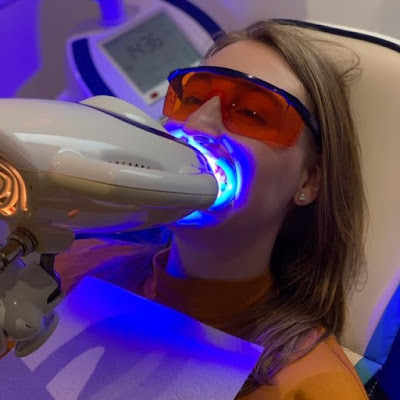 If you’ve ever thought about having your teeth whitened then this really is the perfect time. It’s a reasonable price, the clinic is lovely and so are the staff. I really was pleased with my results and will definitely go back for top ups in future. If you do book a treatment please do tell them you found them through The Breastest News. Thank you.